At the end of the World Open Chess Tournament, word was being circulated that a discussion would take place amongst the Black players who were interested in charting a course for the future. The meeting eventually took place outside the skittles room and the issues flowed naturally. The meeting started informally around 10:30pm and close to 20-25 people stopped by throughout the duration to listen in. Over the past years, there has been increasing activities in the Black community as far as chess is concerned, but it has yielded very little in terms of producing more Masters. GM Maurice Ashley contended that the way he became a Grandmaster is not a viable strategy conducive to producing Black GMs in the long run. There has to be a development plan in place. GM Ashley stated that much of the Black talent that he has seen and coached reach about 1800 or 1900 strength and then they stop playing. Jamaican Master Geoffrey Byfield stated that the approach he has taken on the island is to market chess aggressively and to change the false perceptions people have of the game. He even stated that he (with FM Warren Elliott) give demos of 1-minute chess so that children will understand that chess is can be exciting and is very different from what they thought was a boring activity. This strategy has apparently paid off as the Liguanea Chess Club has about 400 children in training. GM Ashley contended that popularizing chess through marketing efforts are fine and good, but it is a secondary issue. The real issue, in addition to increasing the number of children playing, is the need to identify talented young players and place them in a special track for instruction. One can certainly see that both of these issues deserve attention. In the Black community, there is a certain stigma attached to chess and the perception must be changed to make the game more approachable. On the other hand, what programs are in place to ensure that talent is properly developed in the long term? 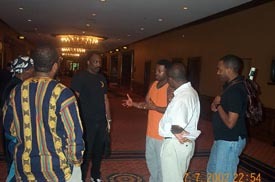 GM Maurice Ashley discusses issues pertaining to the development of young talent in the Black community. There are successful programs, but most are limited because they exist as after-school programs where the goal may not necessarily be to nurture talent. Regardless of the format one suggests for a chess program, the issue of finance is a serious issue. The question of corporate sponsorship was raised, but received a mixed response. Suggestions of using Black chess-playing celebrities to spur interest and to lend financial support was also discussed as an avenue. NM Glenn Bady, a successful coach in Philadelphia, even suggested that non-profit entities could serve as avenues for funding. NM Glenn Bady makes a point while Jonathan Corbblah (back), James Taylor, and Ted Fagan listen. Of course, whenever there is a proposal to receive funding you have to be convincing. Daaim Shabazz suggested that The Chess Drum (1000+ pages of information) could be used in such a way. There certainly needs to be a way to reach the non-chess public in the Black community to understand what chess has done and is capable of doing. Anyone can see the impact the Williams sisters and Tiger Woods have made in their respective sports… and these were sports Blacks paid almost no attention to a decade ago. 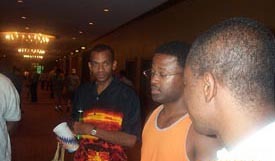 FM Stephen Muhammad joins in the discussion to hear GM Ashley make a point. Geoffrey Byfield of Jamaica is near right. While the meeting was still in progress, FM Stephen Muhammad walked up and received a hearty congratulations from GM Ashley and a nice round of applause for having just earned his 2nd IM norm! FM Muhammad mentioned the untapped potential for chess activity in his area, and that "the sky is the limit." In fact, there are many educational agencies around the country who have finally recognized the merits of chess and cannot find enough qualified chess instructors to fill the slots. The meeting ended on a positive note and it was agreed that much of the communication would have to be conducted online considering the dispersion of players around the world. The meeting ended around 11:30pm after which everyone scattered, but mostly went back into the skittles room. Stay tuned for updates! !